aladylookingforward | Praying. Living. Loving. Waiting. With all the hustle and bustle that come with this time of year I would like to challenge you all to reflect on the love and life that we celebrate. Think about Mary, she had so much on her plate. She was carrying the savior. Think about Joseph, I’m sure he felt a little anxiety about taking care of his pregnant fiance. But in the grand scheme of things, Jesus was born, he was the ultimate gift of love and sacrifice. I love this season so much, not because of the presents and lights and family time….I love all of that but the main reason that i love this time of year is because of the celebration of life. I am so thankful for Mary and her faithfulness to God but more importantly I am thankful for My Savior. Merry Christmas! I pray that it is full of love and laughter and blessings. And take some time to remember why we celebrate. From my family to yours….have a safe and merry Christmas and happy new year! 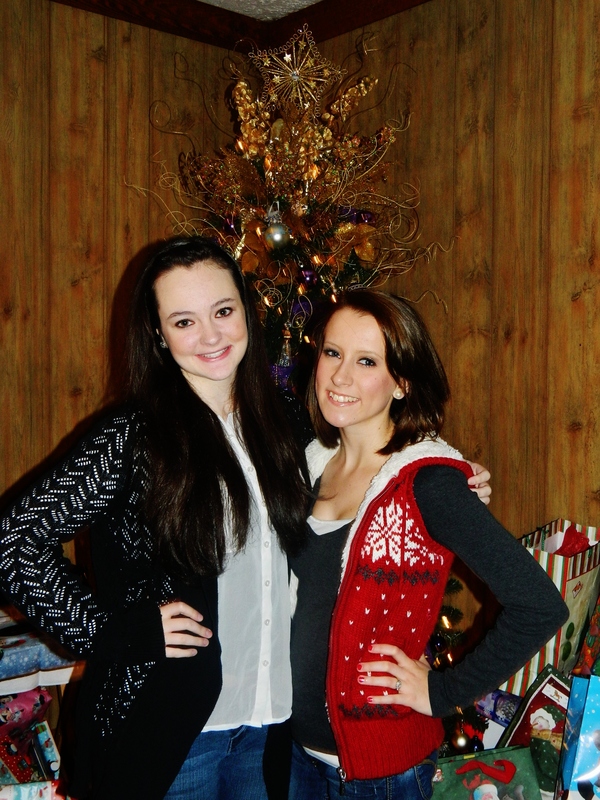 my best friend and I last Christmas! When you’re a kid, Christmas is Jingle bells, Santa Claus and presents but as you get older Christmas becomes so much more. There are always the Christmas tradtitions. For my family, we have a Christmas eve party at my house with all of the cousins, aunts, uncles, friends, everyone. We all eat, hangout, play the white elephant game, read the story of Jesus’ birth and sing silent night and then everyone goes home. That tradition has remained solid, no exceptions. However, As we’ve all gotten older things have changed, all the cousins have gotten married, had kids, and moved away so not everyone is able to make it home for Christmas eve every year. Also, there are traditions that have not necessarily changed but have been altered. For instance, when my brother and i were younger, after everyone left on christmas eve, we would get to open one present(usually Pajamas), and then we would lay out cookies for santa and go to bed. 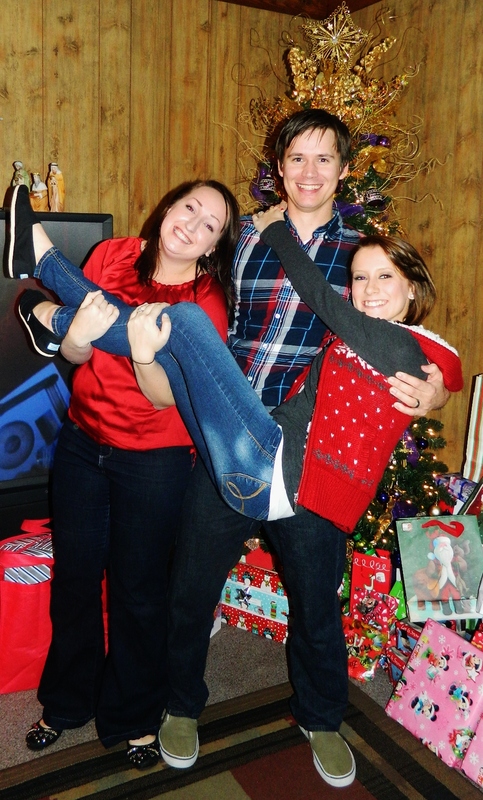 Now, My brother is moved out and married, so after everyone leaves, we do Christmas with him and his wife. And then they leave and me and my parents watch a movie. Now, Christmas morning is probably where some of my fondest childhood memories took place. I remember when i was younger, I would wake up before everyone else and try and go wake up my older brother, there is a 9 year age difference between the two of us so you might see where this became difficult. I would try to wake him up and he would make me get back in the bed and wait until he was ready to get up, or until I annoyed him enough to get up and go get mom and dad. We would go downstairs and see what santa left and then my mom would make our traditional Christmas breakfast, and then the grandparents and cousins would all go over to each others houses and see what everyone got. (we were all next door neighbors). As I get older, I wish that I could go back and tell my 5, 6, 7, 8 year old self to savor the moments, Now i would give anything to have a Christmas morning like the ones I did when i was a kid. Don’t get me wrong, Christmas is still AMAZING around my house. We still have the same traditional Christmas Breakfast, we still open presents, and we still have fun, it’s just a little bit more intimate now. The older I get, i start to think about the future, and I’m realizing that there always was a time for my cousins, when they grew up, and they had their last Christmas morning at home, i know they did, and I am trying so hard to savor the moments that I have, because one day, I’ll be grown, and on my own, starting my own traditions with my own family and I’ll be the one coming home for Christmas. So in this season, I challenge you to stop and reflect on the memories that you have with your families, on your traditions, and really savor the moment that you have this Christmas season. It’s that time of year…..The time when everyone comes home, everyone eats lots of food, everyone goes on the crazy rampage of shopping, and Everyone celebrates their “thankfulness.” But often times we forget why we are to be thankful. I know everyone is thankful for their family, friends, home, jobs, church, etc. but are we noticing and giving thankful recognition to the small things that we are to be the most thankful for. Today all of our family came in; Aunts, Uncles , Cousins, everyone! When I came home from seeing everyone….I sat down to relax before I had to get up and start baking thanksgiving treats. I thought back to each visit that I had with my family members. I thought about the younger cousins that sat with me at my aunts, I thought about how they look at me, what they think when they think of their older cousin Leah. i hope that they see someone worthy of following, someone who is fully trusting in the path of Christ, someone who lives by example and paves the way of purity and modesty; and for those little girls….I am thankful. I am thankful because they make me want to be a better me. They give me the drive and ambition to continue in my pursuit of excellence, they give me courage and hope to continue moving in my walk with Christ, I am thankful for their accountability that they do not even know that they offer. As I sat and thought about the visits, I thought about the many things within the past year that my family has gone through. In April, my grandmother had a stroke and we really were not sure if she was going to make it or not, but today she is much better and although she is not cooking thanksgiving dinner for the first time in, forever, I am thankful that she stayed strong and is continuing to heal and get better and that we have another thanksgiving to spend with her. On a different note, I have become very sentimental and reflective since I answered the call to missions. As we have been in preparation for thanksgiving and tomorrow we will fellowship and eat and all that, I am thankful for this time that I have. I do not know the plan that God has drawn out for me. But I am preparing myself for the day that I am in a foreign country and can’t come home for thanksgiving so I have to create my own little thanksgiving, wherever I am. I have no idea where God will lead me but I know that he is designing my path to a T and I am thankful for the unseen plan of God. I am very thankful for the fun and laughter that I get to have with my family. Whether it is something silly that my parents and I think is the funniest thing in the world, or if its me and the little cousins giggling about something funny one of them have done, or if its something that my grandma and I have noticed and have found comical. I am thankful for it all. Every laugh, every smile, and every memory that comes along with it. Lastly, I am thankful for the overflowing love and power of our Lord Jesus Christ. I am thankful for the cross and the debt that was paid. I am thankful for God having a plan for my life, and I am thankful for the compassion and mercy of Christ. I pray that you all have a fun, exciting, safe, and blessed Thanksgiving! I’m pretty sure that when Highschool was invented it was not intended to be the Black hole in the lives of teenagers….. Recently I have had a really difficult time juggling my life. Between school, work, church, friends, music, family, and just life in general…. We are now half way through the first semester of this year and I really cannot seem to remember anything that has happened within the last few months. When I first started this blog, I was so excited to post like every week…..however, it has now been months since I have written a single blog post. My school newspaper(in which I am on) uses this same blog site and I’m pretty sure I spend more time on that wordpress than my own. Nothing new has really happened. I went to a baptist association conference where I met the local campus missions director, who gave me some insight on different colleges and I got to speak with several different missionaries. Altogether it was a really great night. I’ll admit, I really did not want to go but as soon as I walked in the door, that changed. Since my last post My uncle…who just so happens to be my pastor….had open heart surgery and my brother….who just so happens to be my youth pastor…..got the chance to preach for the last few Sundays, and he did an amazing job. I could not be more proud of him and I am so excited and encouraged to see how God is using him. Hopefully I will not take anymore 2 month breaks….but if I do….just know that I will eventually come back.